Published: March 11, 2015 at 11:47 a.m. Updated: March 11, 2015 at 03:31 p.m.
1. They say business shouldn't be personal, but this was for the Jets. We're talking about a franchise that hasn't had many nice things. They had one in Revis, let him go, and became determined to bring him home. Paying quarterback money for a soon-to-be 30-year-old cornerback might raise eyebrows, but there were layers to this onion. 2. The money isn't that crazy ... relatively speaking. Would you rather pay Darrelle Revis $16 million per year or Byron Maxwell -- the other, other guy in Seattle's secondary -- $10 million per year? The Jets broke the bank, but they did it for a sure thing. How many big-spending teams this week can say that other than the Dolphins? 3. Never underestimate the importance of sticking it to the Patriots. This has been a mostly one-sided rivalry since Brady and Belichick got to town, but this is the Jets' biggest moment in the border war since their January 2011 playoff win at Foxborough. 4. Poor Rex. Oh man. He deserved so much better than this. John Idzik, for reasons that may forever remain unclear, doomed the popular coach with a bare cupboard. Then the new GM actually -- you know, general manages -- and now Ryan will face Revis twice a year. It's Murphy's Law for the Irishman Rex. 5. Speaking of Murphy's Law, here's the worst-case scenario for the Jets: Revis gets hurt early in the deal or pulls a Nnamdi and drops off a cliff performance-wise. 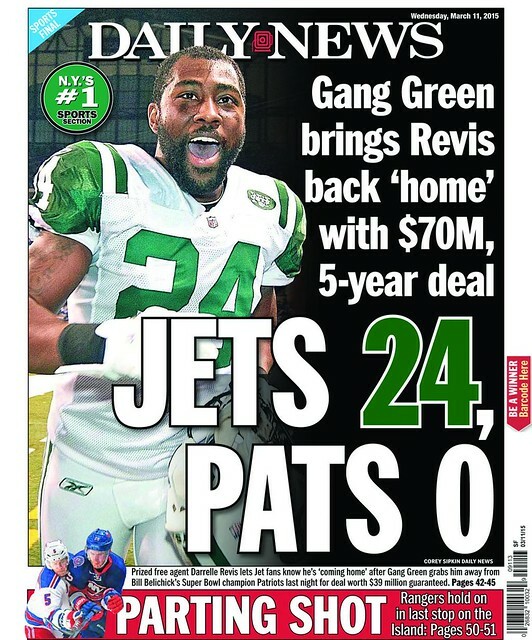 The Jets approach Revis about the "unbalanced" financials of his contract and here we go again. Best case: Revis remains an elite corner for another couple years, then goes into a nice late-period Champ Bailey run through the end of his deal. He retires a Jet, goes into their Ring Of Honor, and becomes the most distinguished alumni since Broadway Joe. This stuff matters to the Jets. 6. We don't buy into the notion the Jets shouldn't have made this move because they don't have a quarterback. We heard the same dunderheaded criticism after the Brandon Marshall trade. This is stupid. The Jets don't have a QB they can trust -- right now -- but does that mean the team should just wallow in misery until Joe Namath's great-great grandson walks in the door? Keep making moves, keep getting better and maybe, just maybe, you'll hit on somebody behind center. The Jets are certainly overdue on that front. 7. These are type of stories that make the back page headline writers for the Daily News and Post be great.